These homemade popsicles are so simple and easy to make! 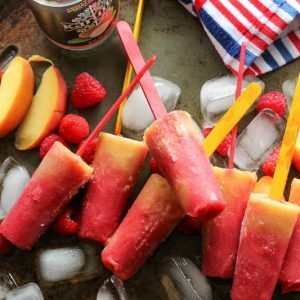 Using fresh fruit like raspberries, peaches, and bananas, this homemade popsicle recipe will keep you cool all summer long! This recipe is sponsored by Karuna Drinks. All opinions are of my own. I know you are anxious to pull out the grill and enjoy some BBQ, but it’s also important to stay cool and hydrated during those fun events. Hydration is a key to both health and building curves because water helps transports nutrients to your cells. 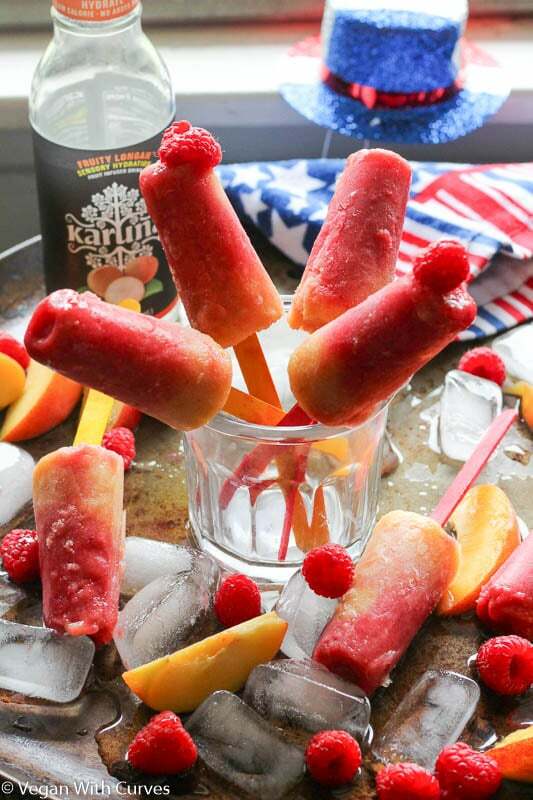 These homemade Popsicles are made using 3 simple main ingredients ; peaches, raspberries, and Karuna’s Essential Nutrition Drink. 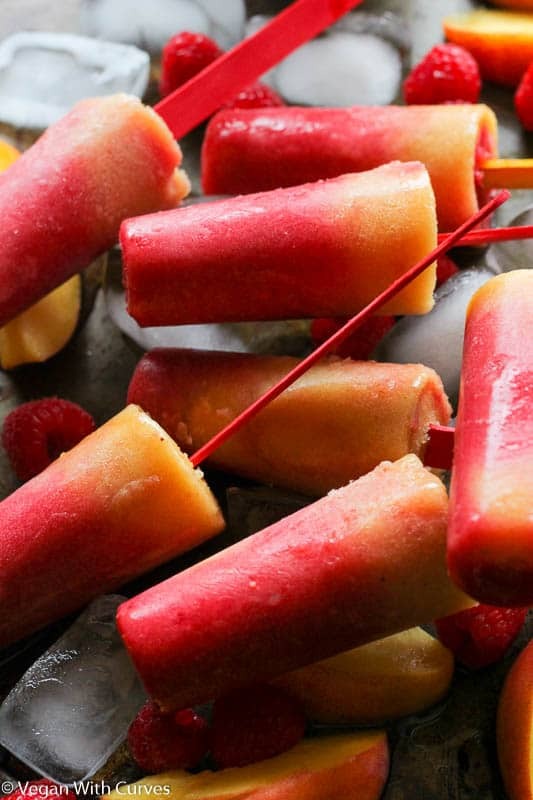 Both peaches and raspberries are plentiful during late June early July which makes these homemade popsicles a perfect treat in time for the holiday. 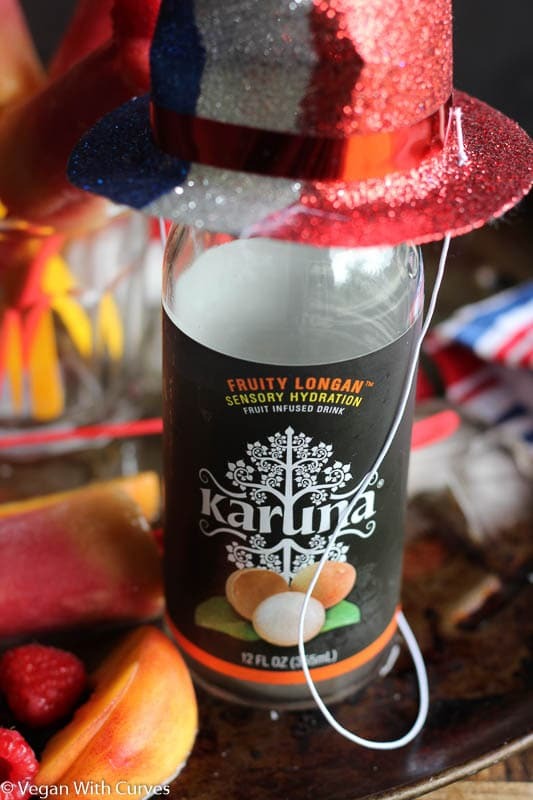 I am a huge advocate of following Mother’s Nature’s eating plan.As you know I support Karuna Drinks because of it’s low sugar and exotic quality ingredients. Longan fruit is another food Karuna introduced me too. 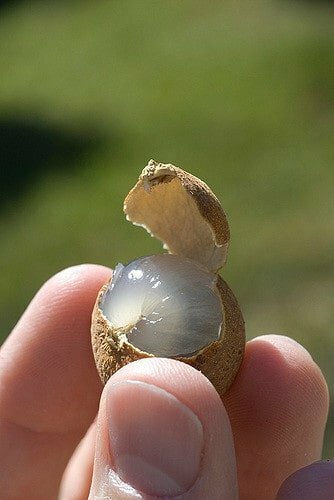 Longan Fruit (pronounced long yan rou )is native to southern China and Burma. It means “dragon’s eye meat” in China which is fitting because the flesh part kind of reminds you of the white part of an eye ball. I do have a confession to make. When I first made these homemade Popsicles, tho they tasted amazing, I struggled with getting them out the mold lol So being the impatient person I am, I used a little too much hot water to loosen them up and they melted before I could enjoy them as an actual “Popsicle.” It was more like a smoothie (sighs). So heads up, be a little more careful and patient than I was. Karuna’s Essential Nutrition Drink, drink is the curve building star. As mentioned above, the Longan fruit is rich in minerals such as iron and magnesium. We tend to only think of macro nutrients (carbohydrates, fats, and proteins) as the only thing needed for building curves, but minerals are vital in making sure your body actually absorb those nutrients. Iron helps transports oxygen throughout the muscle tissue. Magnesium helps with physical energy, proper nerve and muscle function. Happy Independence day everyone! Enjoy your holiday! DID YOU MAKE THIS RECIPE? Tell me how it turned out for you! Was it a hit or miss? 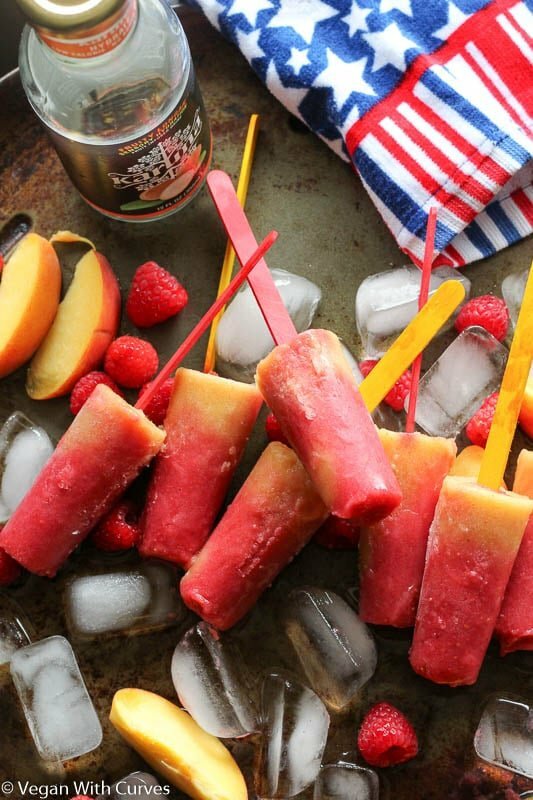 What fruit do you use to make your homemade popsicles? Tell me about it. Leave a comment below, rate it, and PIN IT!Also tag a photo @_VeganWithCurves and hashtag #VeganWithCurves on Instagram so I can see it! Add raspberries, 1/2 cup of Fruity Longan drink, and half of a banana to a blender. Blend until smooth. Take raspberry puree and pour it into a bowl. Start by adding 1 tablespoon of sweetener to your puree and if it is not sweet enough add another tablespoon. Mix well and set aside. Gently rinse off your blender container with plain water (don't wash) and add chopped up peaches, 1/2 cup of Fruity Longan drink, and other half of banana to blender. Blend until smooth. Start your assemble. This is where you can get creative. Take out your 8 Popsicle molds and get ready to assemble. Start by taking 1 tablespoon of raspberry puree and pouring it into the bottom of each mold. Then take a tablespoon of peach puree and pour that on top of your raspberry puree in each mold. Alternate back and forth between peach and until all mold are filled and all puree is gone (or at least almost gone) This creates a natural ombre effect when your Popsicle's freeze. Pop in freezer overnight or at least for 4 hours. Once set carefully remove from molds and enjoy! You do not have to create layers. If you like take all your ingrediants and throw them into a blender. You will still get the same amazing taste. This works well with any berry or any fruit of your choice. I used these berries because they are fresh and in season but you can use whatever you choose. Try cutting up slices of peaches and sticking them inside the mold for an even more dymantic fun look and taste.